F. James Fielding is seated in the second row from the front, 15th from the left. 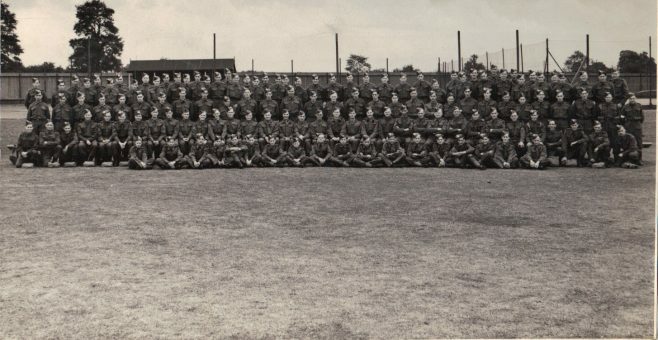 Do you recognise anyone in this photograph, or were you or someone you knew in the Fielding and Platt homeguard? Maybe you worked at Fielding’s and watched them parade or train, or perhaps you heard stories about their work? If you have any memories, stories, or information about the Fielding and Platt homeguard please share them by adding a comment about this page below. Could I see a higher resolution copy of this photograph. I am looking for Les Wheeler. Arthur WILLIAMS, back row, 4th from the right. More of his details are on the “The Williams Family” page. I recall Dad telling me how they were on duty one time and someone accidentally let fall a grenade down into the shelter they were using. He told me how quickly they all scattered not knowing the grenade was harmless!